The PMHP conducts integrated research to develop and refine maternal mental health service models. We conduct independent research and are also involved in several collaborations with international research consortia and other institutions to partner on bigger projects. The research focusses on the distribution and determinants of several aspects of maternal mental health including depression, anxiety, suicidality, alcohol and substance abuse, food insecurity and domestic violence. We are involved in research that linked to screening tool development and validation. We are investigating the impact of our capacity building and support intervention for care providers working in primary health care (rural and urban) as well as in Child Protection Teams. We contribute to systems strengthening and public health research for mental health integration in South Africa as well as several low-income countries. C Hanlon, A Fekadu, M Jordans, F Kigozi, I Petersen, R Shidhaye, S Honikman, C Lund, M Prince, S Raja, G Thornicroft, M Tomlinson, V Patel, British Journal of Psychiatry, 2015 Oct 7. pii: bjp.bp.114.153767. S Honikman, S Fawcus, I Meintjes, The South African Medical Journal, April, Vol. 105, No. 4, 284 – 286. E Baron, S Field, Z Kafaar, S Honikman, Health and Social Care in the Community Journal doi: 10.1111/hsc.12167. S Mall, S Honikman, B Evans, L Swartz, and C Lund, Informa Healthcare Disability and Rehabilitation: Vol. 36, No. 13, 1092-1099, doi:10.3109/09638288.2013.833300. Maternal mental health care: refining the components in a South African setting in Global Mental Health (2014) S Field, E Baron, I Meintjes, T van Heyningen, S Honikman, chapter in Essentials of Global Mental Health, Cambridge University Press, 173-186. B Vythilingum, S Field, Z Kafaar, E Baron, DJ Stein, S Honikman, Archives of Women’s Mental Health, April, 1-9. doi: 10.1007/s00737-013-0343-1. S Honikman, T van Heyningen, S Field, E Baron, M Tomlinson, PLoS Medicine, DOI: 10.1371/journal.pmed.1001222. I Meintjes; S Field, L Sanders, T Van Heyningen, S Honikman, Journal of Child & Adolescent Mental Health, Vol. 22, No. 2, 73 – 82. S Honikman, H Rosenthal, S Faure, B Wirz, S van Zijl, M Littlejohn, N Bergman, S Fawcus, Mental Health Promotion: Case Studies from Countries, WHO/WFMH, (Eds. S Saxena & PJ Garrison), 84. The PMHP identified a major obstacle to providing mental health care: the relevant mental health screening tool validated for our setting, the Edinburgh Postnatal Depression Scale (EPDS), does not address the context-specific needs of our health system. The EPDS has proven too cumbersome for routine use in busy antenatal clinics, and it is not sufficiently sensitive to a context challenged by HIV/AIDS, poverty, high rates of violence and trauma and a severe lack of social support within low-income communities. The high prevalence of maternal depression in South Africa requires that maternal mental health screening, performed routinely and on-site, be logistically feasible and responsive to the local risk factors which may influence mental distress. To address this gap, we have developed a brief 5-question screening tool to identify symptoms of depression, anxiety and suicidal ideation. The study was based at our Hanover Park site. Women attending the maternity service were screened, offered counselling if required and referred to social support services where appropriate. Screening included the PMHP’s risk factor assessment, as well as several other risk and mood screens which are being assessed against a diagnostic gold standard. The most robust screening items were identified for inclusion in a valid, responsive and pragmatic new tool which may be used in limited-resource settings. 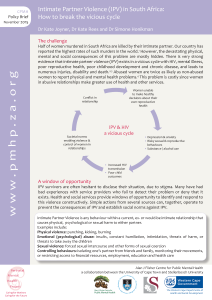 Intimate Partner Violence (IPV) in South Africa: How to break the vicious cycle. 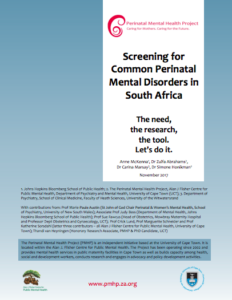 Screening for common perinatal mental disorders in low-resource, primary care, antenatal settings in South Africa. 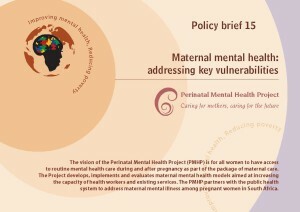 Integrating maternal mental health into existing health and development programmes. 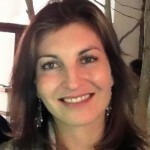 Integrating mental health into South Africa’s Primary Healthcare Re-engineering Plan. Maternal mental health: addressing key vulnerabilities. 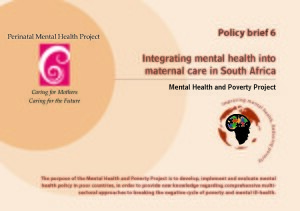 Integrating mental health into maternal care in South Africa. Department of Obstetrics and Gynaecology, University of Cape Town (UCT), Research Day (local presentation): Predictors of alcohol and other drug use among pregnant women in a low-income urban setting. Annual Symposium on Community Mental Health. 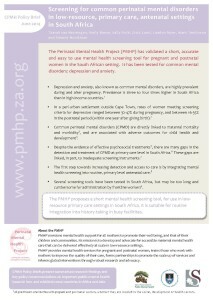 Elizabeth Donkin Hospital – Port Elizabeth, South Africa – Maternal Mental Health – why and how we should respond. Department of Psychiatry and Mental Health UCT, academic meeting (local presentation). Prevalence of antenatal depression and associated risk factors amongst low-income women living in Hanover Park. Mental Health Research and Practice Development Conference – Mzuzu, Malawi – keynote address: Maternal mental health service development. Toward Carnegie III: Strategies to overcome Poverty and Inequality – University of Cape Town, South Africa – Creating capabilities through maternal mental health: a case study at Hanover Park. Marcé Society Perinatal Mental Health Conference, Paris, France. 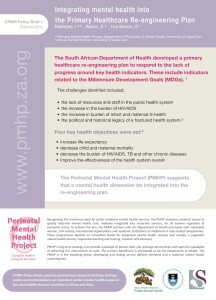 – Integrating mental health care into maternity settings: lessons from a decade’s work in South Africa. Perinatal Priorities Conference – Eastern Cape, South Africa – Maternal Mental Healthcare: Refining the components in a South African public health setting. 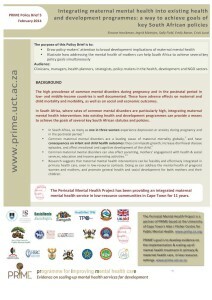 Western Cape Mental Health Summit – Cape Town, South Africa – Integrated mental health care: a cross-cutting solution. Marcé Society Perinatal Mental Health Conference – Pittsburgh, USA – Mood changes in the Perinatal Mental Health Project. South African Society of Psychiatrists Conference – South Africa – Maternal Mental Health: addressing key vulnerabilities. African Health Facilities Conference – Durban, South Africa – Maternal mental health care: a model for integration. National Department of Health Midwifery Summit – Johannesburg, South Africa – Maternal mental health care: a model for integration. Expanding our Horizons: Moving mental health and wellness promotion into the mainstream – Toronto, Canada – The ‘secret history’ method: training maternity staff for mental health promotion in Cape Town. Maternal antenatal distress: risk factors and service utilisation in a South African setting. South African Development Community (SADC) Protocol on Gender and Development Ratification Seminar – South Africa – Putting maternal mental health on the agenda. South African National AIDS Council working meeting of the NGO techincal task team – South Africa – Care for the caregiver and mental health protocols. International Mental Health Conference – Institute of Psychiatry at The Maudsley, London, UK – The Perinatal Mental Health Project: A summative evaluation of a pilot implementation programme. Paediatric AIDS Treatment for Africa (PATA) Conference – Kigali, Rwanda – Mental health considerations for mothers and caregivers of HIV positive children. UCT Department of Obstetrics and Gynaecology – Cape Town, South Africa – Perinatal Mental Health in Context at Postgraduate Refresher Course. Priorities in Perinatal Care in South Africa – Limpopo province, South Africa – The Perinatal Mental Health Project: an introduction. PRIME is a consortium of research institutions and Ministries of Health in five countries in Asia and Africa (Ethiopia, India, Nepal, South Africa & Uganda), with partners in the UK and the World Health Organization. We collaborate with PRIME as a cross-country partner to generate research evidence on the implementation and scaling up of treatment programmes for priority mental disorders in primary and maternal health care contexts in low resource settings. AFFIRM is a research and capacity development Hub established in 6 countries: South Africa, Ghana, Uganda, Zimbabwe, Malawi and Ethiopia. We collaborate with AFFIRM in their Randomised Control Trial (RCT) assessing a maternal mental health intervention delivered by community care workers in Khayelitsha, Cape Town. Thandi is a Clinical Psychologist and researcher who is registered for a PHD at the University of Cape Town, School of Public Health & Family Medicine. Her work is based on the PMHP’s screening tool development study at Hanover Park. Opportunities exist for the PMHP to host graduate students undertaking Masters or Doctoral studies engaging in high quality research of mutual interest in a range of disciplines such as anthropology, disability studies, psychiatry, psychology or economics. Interested applicants can contact us with a brief description of research interests or proposal concepts. Selected individuals will be mentored by experienced staff within the Department who will, where possible, assist in facilitating the procurement of funding as well as the necessary logistical procedures for the work to take place. Formative work towards the development of a group-based intervention for vulnerable mothers. Apply research findings and lessons through our government and non-government partner organisations to deliver mental health services to women. Inform maternal mental health research and policy at all levels through dissemination of research findings. Support/enhance the sustainability of the PMHP operations and maternal mental health services through direct application of research findings to service sites.